Although somewhat reserved around strangers, these are lovable, affectionate, boisterous little dogs that are eager to learn. 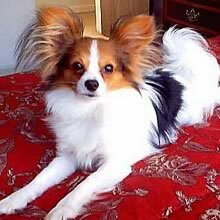 Depending on how socialization was carried out, some Papillons may be jealous if their owner's attention is diverted elsewhere. This is not usually the case, however. They generally get along quite well with children and other household pets. The exercise needs of this dog are uncomplicated. It will adapt itself to the activity level of your family.